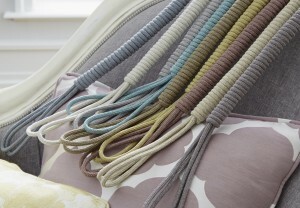 Lustre is a new range of tiebacks, It is available across nine colours; each colour fits with this seasons trend of pastels and neutral shades. Each colour is a familiar shade, ranging from slate to ochre and duck egg, they are diverse and will work with a wide range of fabrics. 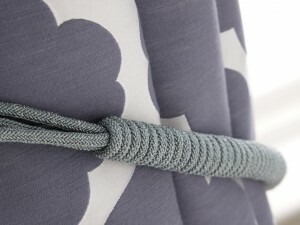 It has a woven rope design that continues through the whole length of the embrace, giving it a rope look and texture. Woven in to the yarn are glistening threads, which gives the tieback more of a luxurious feel and reflects the colour of the tieback itself. Lustre is the perfect summer accessory for any window display and is guaranteed to bring a little bit of luxury to your home. For a great summer look, pair Lustre with our Botanical fabric range. 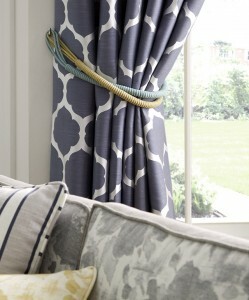 The soft pastel shades and floral patterns make this a great fabric to lighten up any space.